The surgical operation or technique used to view the upper chest area, inside and in front of lungs, called as mediastinum is known as mediastinoscopy. It is a type of test to take the sample of the infected area. During mediastinoscopy, a small cut or incision is made by the surgeon in the neck region right above the breast bone or on the chest at left side which is very next to the breast bone, and then through this cut enters a thin tube like scope inside the upper chest area. The scope take the tissue sample of lungs and then these samples are observed under microscope. Mediastinoscopy is done to check any kind of infection, inflammation or cancer in lungs. 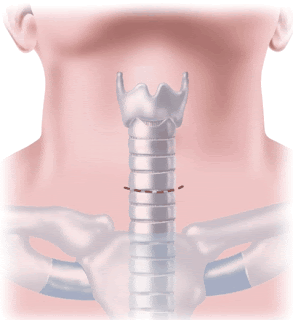 Lymph nodes may also be checked by mediastinoscopy which will decide whether the lungs require to be removed or not. Tuberculosis and sarcoidosis are identified by mediastinoscopy. There is a consent form which the patient have to fill before surgery, in this form the patient agree on the risks of mediastinoscopy. The physician ask patient some questions before surgery like, if he is on blood thinning drugs or have any kind of allergy to the medicines like anesthetics. Mediastinoscopy is used to take tissue sample of various conditions or diseases like lung cancer. Mediastinoscopy is a type of diagnostic methods. It is performed to check the presence of cancer in the lungs and if the cancer is present, it is performed to check the severity of the cancer disease. It is also performed to take the samples in a condition named sarcoidosis. Hodgkin’s disease and lymphoma also require mediastinoscopy to diagnose. Mediastinoscopy is performed to check the performance of lymph nodes in lungs. Any kind of infections effecting lungs like tuberculosis TB are diagnosed by mediastinoscopy. The mediastinoscopy is performed under general anesthesia. The patient have to answer some questions before anesthesia to make sure that he do not have any allergies against anesthetic drugs. The patient is guided before surgery about possible outcomes, if the patient is asked to have some medicines then he have to take these medicines on the day of surgery otherwise the surgery would be cancelled. Jewelry and other wearables are also asked to remove before anesthesia. Glasses and contact lenses are also asked to be removed before surgery. Due to the late anesthetic effect, the patient is asked to bring someone with him. Mediastinoscopy is performed under general anesthesia so the patient will take time to recover from its effect. When patient comes out of it, the nursing staff in the recovery room check the vitals of the patient i.e. heart beat, temperature and pulse rate. The incision is also inspected to check the bleeding from the wound. The cut should be kept clean and dry to avoid any infection at the site. The patient should follow a follow up plan and should take proper medicines prescribed by the physician. All rights reserved to Healthcaretip.com | Powered by Blogger.